We usually think that babies are born crying. And for most of us this was undoubtedly true. Some of this stems from the tradition of doctors slapping babies on the behind to start or confirm their breathing, and the need for this was augmented by the introduction of drugs to alleviate the pain of a woman giving birth. 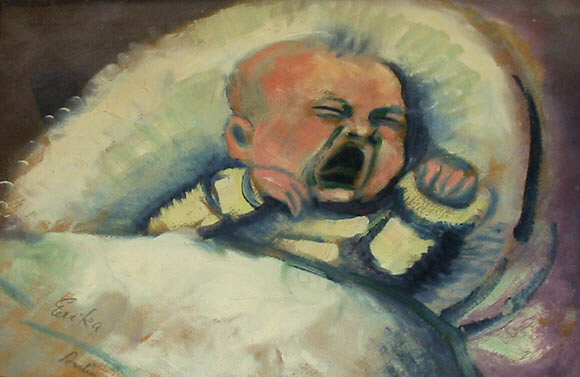 The advent of chloroform for this purpose in the 1800s and the use of the “twilight sleep” of morphine and scopolamine in the 1950s, 60s, and 70s (perhaps even the use of epidurals now) led to an increased risk that a baby might not otherwise breathe properly because some of the drugs often got into the baby’s system as well as the mother’s. Today it’s more likely that a baby will be vigorously rubbed with a towel than held upside down by the ankles and whacked on the bottom. Since the 1970s, various takes on natural childbirth have attempted to make the birthing process less traumatic for the baby as well as the mother. These include creating atmospheres that are dim, warm, and quiet, and leaving the umbilical cord attached a little longer so that the baby can still get oxygen that way and make a more gradual transition to air-filled lungs. There are even those who give birth in water, supposedly easing the transition from the fluid-filled womb. Sometimes babies grunt and growl or simply gasp rather than crying, and as long as the baby is pinkly oxygenated and breathing deeply to fill all the little newly inflated alveoli in the lungs, it’s perfectly healthy. Even today, though, most babies cry at birth. Some even cry before they are quite out of the womb, perhaps giving credence to the idea that traveling down the birth canal in itself is uncomfortable. Other theories of why babies cry involve the startling experience of encountering cooler temperatures, noise, and light. Some note that babies’ crying is their first communication that something is wrong–at least that they are cold, and maybe also scared of all the hubbub. Our first method of communication is definitely crying, and it is the prime way that infants get what they need. Posted in Health & Illness, Psychology. Bookmark the permalink.